Logitech has announced one of the more intriguing gadgets of the year – a solar powered keyboard. The Logitech Wireless Solar Keyboard K750 is a veritable Chilean miner of the keyboard world, as it can be kept in the dark for three months before losing its charge. It doesn't need the sun either to charge up - according to Logitech any old indoor light you have will give the K750 its powers. To make sure you know when the keyboard is running low there is a battery level monitor, low-power alert and even a lux meter on board to help you get the right light. The keyboard is 7.5mm thick/thin and has rounded edges. Logitech says this makes it stylish, like when the kids of today tuck their jeans into their boots. The concave design and incurve keys also shape around your fingertips like your very own keyboard glove. 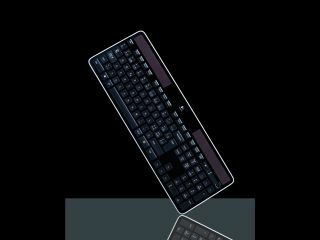 Logitech Wireless Solar Keyboard K750 has a UK release date of January 2011 and will cost £69.99.